Welcome to Jabberjays.net. Okay, so it was tiniest of beginnings; barely a blip on the map of Panem. It sat as inconspicuous as a skinny Seam kid in an outlying mining District. But as you know a certain instinct for survival, a spark of inspiration and an uphill battle of endless hard work can make a rebellion happen. The site wouldn’t have an official launch for a further two months but it existed; even though no one seemed to notice or care. Within just one year however, Jabberjays.net grew to host a crowd of frequent commenters, a flurry of followers and established a community for Hunger Games fans to discuss Suzanne Collins’ stories. In an almost carbon copy repeat of the year before, 2014 began with Jennifer Lawrence on the awards circuit, entertaining on the red carpet and picking up a few awards to boot for her performance in American Hustle. Lawrence won the Golden Globe and the BAFTA for Best Supporting Actress and a SAG award for Outstanding Cast in a Motion Picture shared with her American Hustle cast members. Though the bits most people remember from the endless awards circuit was Jennifer photobombing Taylor Swift and freaking out when meeting Damien Lewis. A BD/DVD trailer for Catching Fire was released and Lionsgate unveiled the motion poster for The Hunger Games: Mockingjay Part 1. Philip Seymour Hoffman passed away in his home in New York, shocking the film and theatre community. Peerless in his acting talent, his contribution to film was never more tangibly felt until it was taken away so suddenly. The Hunger Games family had lost one of their own. The most fitting tribute we came across from the many outpourings was a 22 minute video celebrating his outstanding body of work. Catching Fire broke in to the top ten of the all-time top domestic grossing films at the box office and was nominated for 7 Saturn Awards. Nina Jacobson confirmed that Tigris would be in the final film and claimed that the set for her shop was spectacular. Julianne Moore spoke out about the major responsibility to the books she felt while making Mockingjay. Jabberjays.net officially launched and we celebrated with a bunch of giveaways to our new (and only) readers. We gave away Blu-rays, DVDs, SDCC pins, cups and theatre tickets. Mockingjay Part 1‘s official synopsis was released. Jennifer Lawrence headed to (fell down) and was in the most retweeted selfie in history at the Oscars after being nominated for Best Actress in a Supporting Role for American Hustle. 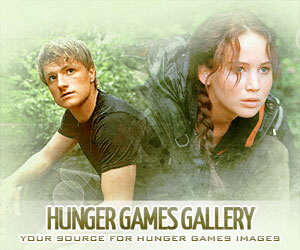 The Hunger Games was included in a video segment during the Academy Awards ceremony highlighting Katniss as a hero. Jennifer didn’t take the statuette home this year but continued the fun heading to the Vanity Fair Oscar after party with Liam Hemsworth and Jena Malone in attendance too. Lionsgate began counting down to the BD/DVD release of Catching Fire and we reviewed Target‘s exclusive combo and the Canadian Collector’s Edition. The DVD went on to sell 3.9 million copies in the first weekend and held on to the top spot in the home video release chart the following week. An Easter Egg was uncovered in the disc for Mockingjay. Filming continued for the two-parter as casting calls were announced again and again. Catching Fire was nominated for seven MTV Movie Awards and won three Kid’s Choice Awards, though we wondered how Katniss was not considered a hero. Francis Lawrence opened up about the emotional and logistical effect the death of Philip Seymour Hoffman had on the cast and crew of Mockingjay. As filming continued we announced and began our regular Through the Pages segment charting and speculating on the adaptation process chapter by chapter. March also saw the launch of the Jabbercast podcast. The popularity of The Hunger Games trilogy was influening children’s book sales as filming of the adaptations continued in Atlanta. Nina Jacobson tweeted a photo of Buttercup on set and rumours circulated that Michelle Forbes was playing Jackson. The Swan House was booked for more shooting and a picture surfaced of Josh Hutcherson that may or may not have revealed his hijacked make-up. We commemorated the cinematic release of The Hunger Games by asking which tribute you missed most and slowly began to wonder when The Hunger Games: Mockingjay Part 1 marketing would really kick off considering how much information, stills and posters we had in comparison for Catching Fire in March, 2013. Willow Shields headed back to Atlanta to film scenes for Part 2. We rounded off the month by trying our hardest to work out the geography of Panem in what was once North America. A decadent show of ill taste was announced with a Hunger Games theme park where you could even visit purpose built arenas and fight to the death. Kidding! Nina Jacobson also tweeted that Buttercup would die in the films. Also kidding! When will people learn to not be so gullible on April Fool’s Day (maniacal laugh)?! Catching Fire was still burning through accolades, being named Best Thriller at the Empire Awards and winning big at the MTV Movie Awards. The film finally left theatres on April 3rd with a worldwide box office haul of $864,565,663. Pictures from the Mockingjay set began to trickle out from Georgia showing aerial footage of possibly the Avenue of Tributes covered in pods. Jabberjays.net attended the Supanova Gold Coast and Melbourne conventions. We contemplated the click bait of misquoting Suzanne Collins and the necessity of Finnick Odair in Mockingjay; interviewed Flavius himself, Nelson Ascensio, on Jabbercast and reviewed Lynn Cohen on the stage. Seemingly from nowhere, Commander Lyme was recast as it was confirmed Gwendoline Christie would be stepping in. Rumours cropped up that a Mockingjay Part 1 teaser trailer may be shown at Cannes. Principal photography wrapped in Atlanta and moved to Europe where fans in Berlin lined the streets for casting calls. Natalie Dormer showed off her Cressida haircut and Elizabeth Banks confirmed that she wrapped all of her scenes and had played Effie for the final time. The month finished up with some Jabberyjays.net fan art. May, the month when every climactic Mockingjay Part 2 scene was filmed in Europe and hounded by the paparazzi. It was confirmed that the Mockingjay crew only filmed in Swan House for five days. The cast and crew were assembled in Paris as more casting news rolled in: Michelle Forbes is indeed playing Lt. Jackson and Eugenie Bondurant would play Tigris. Exterior scenes were filmed across the French capital and videos and images began to flood the internet. We saw a crowd of Capitol refugees searching for safety, Katniss and Gale hiding in the crowd (later confirmed by Jennifer Lawrence), Captiol crowds on the street, Cressida and co running as gunfire erupts, battle scenes with Peacekeepers, Star Squad 451 walking through a communal garden in Noisy-Le-Grand, more Peacekeeper gun fights, Katniss, Peeta, Gale, Cressida and Pollux running up stairs at night, more Star Squad 451 with added Boggs and then with Leeg 1 and 2, bomb explosions and injured comrades, more death, more scrambling to survive and to top it all off Peeta attacking Katniss and attacking her again. Put it like this, the residents of Noisy-Le-Grand had front row seats to Katniss’ assault on the Capitol! Meanwhile posters were cropping up for Mockingjay Part 1 at Cannes and fans had a first look at the tagline. It was confirmed soon after that there would be a decadent Capitol style party at Cannes and soon a fiery promotion was set up at the Majestic Barrière on the Croisette. Jabberjays.net had just about enough time to catch our breath, unveil a snazzy new look before the sleeping Lion(sgate) was awoken and a new site was launched: Hunger Games Exclusive. There were stills of Haymitch, Plutarch, Coin and more, video of Julianne Moore talking about Coin, script pages to read, and an extensive interview with Francis Lawrence, Nina Jacobson and Peter Craig that revealed Effie was in District 13, Philip Seymour Hoffman’s unfinished scenes would not be recreated with CGI, The Hanging Tree would be a highlight and the scale would be bigger. The motion poster was released and a hi-res non-motion version was offered. The cast and crew took brief respite from filming and went to Cannes to walk on the Croisette, give the occasional interview a few times but mostly to party. And what a party it seemed to be. The festival also gave us the first glimpse of the Mockingjay Part 1 promotional pin. The festival was doubly fun for Julianne Moore who also picked up the Best Actress gong for her performance in Maps to the Stars. We cleared up some confusion as to how a family of Mockingjays became a family at Jabberjays.net and how the site came to be in the first place. The film crew moved to Berlin and Nina Jacobson reassured fans about the Epilogue. Rumours were heard in Germany that Liam Hemsworth was injured and that filming was taking place in an abandoned chemical plant. Set photos surfaced which confirmed District 2 scenes were being filmed at Templehof, Berlin. Readers sent us photos of rubble, military vehicles and the cast assembled including Woody Harrelson. Jena Malone joined Elizabeth Banks and confirmed that she too had now wrapped Johanna Mason. We gave away a Mockingjay keychain and zipper pull just for the hell of it or maybe because subconsciously we believed that if we gave to others, maybe the universe would reward us back with a trailer, which by now we were mentally willing to magically appear. Lionsgate made an announcement (not about a teaser trailer) that The Hunger Games touring exhibition would open in 2015. Then Lionsgate made another announcement (also not about a teaser trailer) that they had partnered with Kabam to create a role-playing strategy game based upon the films marked for release in November. We launched our newsletter, District Debriefing. Catching Fire wasn’t finished with awards yet: Trish Summerville won the Saturn Award for Best Costume, the official trailer won Best Action Trailer at the Golden Trailer Awards and the film was nominated for four Teen Choice Awards. We highlighted how the marketing from the first film was taken straight from the propos in the Mockingjay novel. In Thailand the District 12 salute was beginning to be used to oppose the military coup and was spreading across the country. Omid Abtahi posted a picture of himself and other cast members doing the District 12 salute. Francis Lawrence tweeted that only 5 days of filming was left and Jeffrey Wright had tweeted that he was returning to Berlin to part ways with Beetee. The end of the series was coming closer. Meanwhile in Panem, a mysterious ‘stand by‘ sign appeared on the Capitol.pn followed by a message about the upcoming celebration of District Heroes. Capitol Couture and Yahoo! released 12 propaganda posters depicting model versions of district citizens saluting them with the tagline: Panem Today, Panem Tomorrow, Panem Forever. The Capitol.pn site was then revamped displaying impassioned language to register and preserve the Panem that was created. Something was afoot on Capitol TV; perhaps not everything was as rosey as the propoganda would have us believe. Jeffrey Wright had wrapped Beetee with only one day of production left. Then filming had officially finished on The Hunger Games series and Nina Jacobson released a picture of Jennifer Lawrence, Josh Hutcherson, Liam Hemsworth and Woody Harrelson in a final group hug. We made a thank you video for them and were thanked by Nina Jacobson. Rumours were brewing in Australia that cinemas had received a possible teaser trailer. A nice piece of marketing changed all of the separate Facebook District.pn and Capitol.pn pages in to One Panem. We had just enough time to launch our Airtime Assault Google hangouts, when the day finally came – Capitol TV would air a message from President Snow that evening. The first propaganda film ‘Together As One‘ showed Snow addressing the nation with Peeta by his side. We had barely enough time to react when a second teaser was thought to soon be on its way. The Capitol.pn relaunced with a new image of Snow and Peeta with an invite to question and submit feedback to show that the Capitol is listening to its citizens and to its Districts. A new Mockingjay Part 1 Tumblr also appeared. ‘Together As One’ was confirmed to be playing in theaters in front of Transformers: Age of Extinction which is surely the only reason I can fathom that anyone would want to pay to see Tranformers 4 (or any Michael Bay film, for that matter). June ended with Forbes naming Jennifer Lawrence the world’s Most Powerful Actress. President Snow’s throne went on sale. A new rumour about another teaser suggested it would be played in front of Dawn of the Planet of the Apes. Another address from President Snow entitled ‘Unity‘ was confirmed to hit and a day later we saw Snow, Peeta, Johanna and some heavily armed Peacekeepers interrupted by Beetee from District 13 informing us “The Mockingjay Lives.” The Capitol then responded that the interruption was due to technical difficulties from overwhelming demand. Jabberjays.net reacted to this slice of in-movie marketing and fans were treated to behind the scenes images from the filming. It wasn’t long until the Capitol.pn was hacked by the rebellion and District 13. Capitol Couture also released new profiles and images of Peeta and Johanna. Of course July means San Diego Comic Con. A new trailer would be debuted at the convention and cast members were going to attend a signing at the Lionsgate booth. Fragments of a picture were being released on the Capitol instagram which were confirmed to piece together in to an SDCC exclusive poster featuring a Peacekeeper and Mockingjay graffitti. Peeta and Johanna were also given ‘living portraits’ in a clearly coerced stance. Jabberjays.net was at Comic Con again to peruse the Lionsgate Mockingjay booth, The Samsung Galaxy Experience Hall of Heroes, which would premiere the new trailer and pop in to Peeta’s bakery booth (yes, a real bakery!). The trailer, ‘Our Leader The Mockingjay,’ was confirmed by those at Comic Con to be a little over a minute and could also be viewed at the Samsung stand at Best Buy. Natalie Dormer, Mahershala Ali, Elden Henson, Wes Chatham and Evan Ross were at Comic Con to sign the exclusive poster. The trailer was finally released and we had our first official glimpse of Katniss. The Jabberjays.net gang reacted with excitement. District 13 hacked the Capitol.pn again with Our Leader the Mockingjay after the Capitol Concern page released more self-affirming propoganda. July ended with news that New Zealand singer Lorde would not only sing the official song for Mockingjay Part 1 but would also curate the entire companion soundtrack. August, the month of being hacked off. The Hunger Games social media pages were updated with a new District 13 logo. Beetee gave instructions to hunt and peck at the Capitol and uploaded his own Capitol Concern. Soon a District13.co.in website was launched that made ‘hacking’ into the Captiol.pn even easier. On the same day District 13 character posters were released across a number of websites including Plutarch, Coin, Beetee, Effie, Haymitch and Finnick. Which caused Jabberjays.net to beg the question: Where in the world is the actual Mockingjay in all of this? Where is Katniss Everdeen? We celebrated Suzanne Collins’ birthday and Catching Fire won four Teen Choice awards though the event was only memorable for Donald Sutherland donning a white rose, taking to the stage and throwing nightlock at teenagers! What a guy! The cast and crew did their first round of press for the film and a new still of Katniss was revealed. District 13 started sharing Our Leader the Mockingjay pictures with websites including Jabberjays.net which showed Mockingjay graffiti on famous locations across the world with the date August 21st. When the 21st rolled around, a new Our Leader the Mockingjay (OLTM) app was released for direct access to messages from the rebellion. Billboards showing the District Heroes propaganda were seemingly defaced with Mockingjay graffiti in California. Rebel character posters were released featuring Gale, Boggs, Cressida, Pollux, Castor and Messalla standing in front of a black mockingjay. The OLTM app hack unlocked the Capitol’s secret file on Cressida. With less than three months until The Hunger Games: Mockingjay Part 1 was released, where the hack was the full-length theatrical trailer? Katniss Everdeen claimed the Guinness World Record for Highest Grossing Action Movie Heroine and a day later was granted an iconic rebel profile poster from behind. OLTM began teasing the date September 10th – sigh of relief swept the fandom as obviously that could only mean one thing: the trailer. The following day, however, it was announced September 10th would actually be the release of a final poster. Not a trailer. Obviously. Lorde recorded her song for the credits and tweeted a picture of the lyrics while over in London, James Newton Howard was recording the score. Josh Hutcherson revealed (with huge spoilers) his final day on set and what the last scene was that he had filmed for the series. The final poster for Mockingjay Part 1 was released featuring Katniss standing before a flaming mockingjay pin. On the same day, a 16 second video showed Katniss lifting a rose in her District 12 home – in 5 days a trailer would be released! A second tease showed Katniss and Gale taking aim in District 8. Finally the theatrical trailer was live! The Hunger Games Exclusive released more stills, promotional shots and an extensive interview with Jennifer Lawrence about Katniss and with Liam Hemsworth about Gale. Scholastic UK announced they would publish new and wildly colorful editions of the trilogy, Mockingjay Part 1 received a PG-13 rating and the recent trailer clocked up over 7.5 million views in 48 hours. Jabberjays.net compiled all the promotional images, stills and trailer in one video and uploaded a fan made poster. Lorde announced that her official song for Mockingjay Part 1 was called ‘Yellow Flicker Beat’ and would be released a week later. Two character stills were released every day – day 1: Gale and Cressida, day 2: Beetee and Caesar, day 3: Castor and Pollux, day 4: Boggs and Finnick, day 5: Plutarch and Messalla, day 6: Haymitch and Effie, day 7: Coin and Snow, day 8: Peeta and Katniss. The Capitol.pn updated with a new still of Caeser and more propaganda including a Capitol TV video explaining why there are blackouts in the Capitol. A second hack on District13.co.in revealed real Capitol Concerns that were posted on the website. A profile on Capitol.pn confirmed that one of Snow’s cabinet is called Egeria, Minister of Affairs. We gave away decals to Join the Rebellion, ’cause who doesn’t like stickers, eh? Lorde teased the second and third line of lyrics and eventually ‘Yellow Flicker Beat‘ was released. A new image of Katniss graced the cover of Ciak magazine and Scholastic released the movie-tie in edition of the novel. Willow Shields uploaded a new still of Prim, a third hack showed a profile of Boggs and Scholastic UK staged a scavenger hunt for Mockingjay novels on the underground in London. Lionsgate teamed up with Doritos to present the UnlockDistrict13 site. ‘Yellow Flicker Beat’ debuted at 17 on Billboard’s Alternative chart. Capitol TV reported that streets within six miles of Snow’s mansion were closed for ‘routine maintenance.’ New stills showed Buttercup and the inner working of District 13 and before you could say overload, new stills were being released almost daily including Gale and Beetee, Katniss and Coin, Katniss in 12, Effie and Castor, Cressida and Peacekeepers. There were rumours that Mockingjay Part 1 would be 125 minutes long and confirmations that the World Premiere would be in London once again. Fans were asked to tweet #UnlockMockingjay to see exclusive content when enough tweets were sent. The widget didn’t progress as quickly as it began and we asked you to tweet quotes replacing words with #UnlockMockingjay producing several hilarious responses. Eventually the content was released showing footage of Katniss visiting District 12 to the sound of ‘Yellow Flicker Beat.’ Meanwhile over at Capitol.pn we had a new Snow still, details on the Peacekeeper force from uniforms to weapons and a District 13 hack revealed a profile and script for Peeta’s forced interview with Caesar. Francis Lawrence told the world that he had completed Mockingjay Part 1, James Newton Howard’s score was said to include ‘The Hanging Tree’ sang by Jennifer Lawrence and Scholastic published special foil editions of the trilogy. We had our first glimpse of the Panem Rising game. OLTM released a schematic of District 13 which we then uncovered to be a map that Effie had fashioned in to a head scarf in stills. We set up a difficult Panem Pop Quiz and celebrated Mockingjay Part 1‘s arrival in cinemas being only a month away by hosting an entire 30 days of giveaways and prizes in our Countdown to the Rebellion. Because we’re just that nice. Capitol TV announced and broadcast five videos titled District Voices as propaganda for the Capitol, starring YouTube vloggers: District 8‘s style (and a behind the scenes video), training Peacekeepers in District 2, generating electricity in District 5, baking Peeta’s recipes in Distict 9 and transporting Peacekeepers in District 6. The tracklist for Lorde’s companion soundtrack was revealed, the singer debuted ‘This Is Not A Game’ by Chemical Brothers on the radio and ‘Dead Air’ by CHVRCHES leaked online from a live show all on the same day. Then a wave of new footage crashed down on the fandom. An epic new Doritos TV spot that surfaced called ‘Choice’ took everyone by surprise, followed closely by stills. Before everything new could be processed another devastating TV spot for Samsung users came out of nowhere and had an official HD release not long after. A gigantic mural of Katniss appeared on the side of a building in Los Angeles and a mosaic cropped up in cinemas. A still of Katniss, Gale and Paylor in District 8 appeared and we finally finished our Through the Pages segment on an Airtime Assault special and unveiled our news app from Google Play. Jennifer Lawrence sparked debate with her comment that fans would “be pissed” at the ending of Mockingjay Part 1. Fandango declared they would release the final trailer and by the next morning ‘Burn‘ was viewed with great excitement as Katniss yelled her iconic message for President Snow. We uploaded 365 screenshots (just to make sure we covered everything) from the trailer as tickets went on sale for the movie and a new motion poster was promoted in the UK. Empire Magazine put Katniss on their cover in an iconic battle pose and gifted us with many new images from the film. US Weekly had more exclusive images for our viewing pleasure. A TV spot was seen during the World Series and we debuted another TV spot called ‘Peeta.’ Jabberjays.net spotted a dog in Catching Fire and in Mockingjay Part 1 promos; Francis Lawrence complimented our dog spotting abilities so we set about trying to find a perfect name for the pooch (Ember is winning). And we had many entries for our Pumpkin carving and costume contests. Happy Halloween! The production notes for the upcoming movie were made available as the promotional craziness was heating up. Jeffrey Wright aided the Ebola Survival Fund by running a competition to win a trip to the LA Mockingjay Part 1 premiere with himself and Josh Hutcherson (he later added Jennifer, Liam, Woody and Sam to the list). Domestic box office predictions believed the film to earn around $385 million. 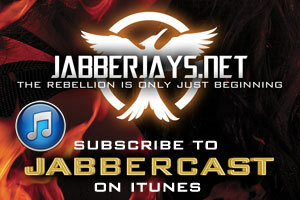 Jabberjays.net hosted Rebel Rewind events to watch The Hunger Games and Catching Fire together as a fandom. We came up with 50 things to do before Mockingjay Part 1 hits cinemas, created our own 80s themed soundtrack and in our Countdown to the Rebellion we gave away 2 tickets to the World Premiere of Mockingjay Part 1 in London to a lucky reader, because we are just lovely like that. James Newton Howard’s tracklist was published, revealing what scenes had made the final cut. Those disappointed that there was no LA fan camp this year may have been cheered up when the first clip from Mockingjay Part 1 of Katniss watching Peeta’s interview was shown on GMA. Huge Mockingjays were spotted in Denmark and France. TV spots kept hitting the web with a particularly good one entitled Battle. News dropped in that Lionsgate had plans for The Hunger Games after the film series was completed. Thankfully it had nothing to do with a theme park. A play is planned for 2016 in London in a purpose built theatre. A second clip arrived of Cressida introducing Katniss to her camera crew. B-Roll footage allowed us to glimpse other scenes and 15 new hi-res photos and 3 behind the scenes images were made public. The cast and crew were in London, we heard our first indication that Jennifer Lawrence was terrified of singing ‘The Hanging Tree’ and the group District Thai spread awareness of people being arrested in Thailand for opposing the military coup using Disrtict 12’s three finger salute. The World Premiere of Mockingjay Part 1 took place in Leicester Square, London. UK Jabberjays Ciara and Luan saw the film and Jabberjays.net’s first reviews of The Hunger Games: Mockingjay Part 1 were posted. The critic reviews were mostly favourable across the board and we updated new ones each week (1,2,3). Sweepstakes tickets for advanced screenings were help and clip after clip emerged: Snow talking to Katniss, Peeta communicating with Katniss, Prim and Katniss in bed, Peeta distressed, Katniss and Gale discussing Peeta, Gale and Cressida followed by an extended clip of the same scene. Clearly learning that Jennifer, Josh and Liam are stronger together than apart in interviews, the press junkets were filled with funny interviews with the trio (1,2,3,4,5,6,7,8,9,10,11,12,13,14,15) They were also reunited with Woody Harrelson for the opening monologue of Saturday Night Live. Sam Claflin attended a premiere in Madrid and Elizabeth Banks headed to a premiere in Berlin. A behind the scenes video was unlocked for Samsung users as more and more and more TV spots emerged. Jabberjays.net uploaded our own Panem Profiles series of videos containing clips and interviews with the cast about their characters. The Peeta Mellark profile proving to be particularly popular on YouTube. As Donald Sutherland teased about a deleted scene with Peeta; Francis Lawrence answered fan questions including one from Jabberjays.net, talked about extending the series in to spin offs or prequels and was quizzed on what deleted scenes to expect on BD/DVD. Almost the entire cast headed to New York for a hilarious and insightful press conference and answered some fan questions too. There were clips of Hayffie and clips of District 8 as Mockingjay Part 1 had its premiere in LA. Days before release, The Hunger Games: Mockingjay Part 1 was pulled from cinema listings in China and moved back for unspecified reasons. A TV spot made critics the central focus and Elizabeth Banks asked badass Jennifer Lawrence some questions. The Hunger Games: Mockingjay Part 1 was releasead in cinemas worldwide on November 21st. We asked for your thoughts and you gave us just south of 400 commments – not bad for a site that didn’t exist 11 months ago; for that, we thank you! We gave more of our own reviews as well over the next few days from Zack, Phil, Carla and Shannon. The filmmakers gave a lengthy interview about adapting the novel, you could already pre-order the Blu-ray in the UK and Jabberjays.net headed to the Montreal premiere to interview Willow Shields. Box office estimates expected the biggest opening of the year, the film earned $17 million on Thursday alone, it dominated in foreign markets and became the number 1 movie in the world by the weekend with $276 million. Katniss Everdeen continued to inspire others in the real world. Protesters against the military coup in Thailand caused the film to be dropped by a Thai cinema chain after young people were arrested for using the District 12 three finger salute and taken away for “attitude adjustment.” Protesters against the shooting of an unarmed youth in Ferguson, Missouri, spray painted “If We Burn, You Burn With Us” on an arch in St Louis. Walmart strikers protesting Black Friday focused on messages from The Hunger Games to highlight economic inequality. Jennifer Lawrence singing ‘The Hanging Tree’ was made available on YouTube and James Newton Howard’s score went on sale. Over opening weekend the song broke in to the US iTunes top 5. By the following week it had climbed to number 2 and broke in to the UK singles chart. Strange things did happen as the song began to soar, reaching number 1 on Amazon too with Billboard predicting the song to break in to the top 40 of the Hot 100 chart. The song was then the focus of a new TV spot. Target were taking BD/DVD pre-orders by offering a brand new Katniss poster and brand new stills hit the web too. Jabbercast reached new heights of popularity (though possibly the episode title ‘The Hanging Tree’ may have helped) and the month ended with a side-splitting Bad Lip Reading of Catching Fire. Mockingjay Part 1 continued to blaze through the box office with a 2nd week atop the world chart and clocking up earnings of $250 million domestic and $500 million worldwide. We were also treated to Elizabeth Banks interviewing badass Julianne Moore. ‘The Hanging Tree’ was now No.1 in 37 countries, in the top 10 in 70 countires and debuted at No.12 on Billboard’s Hot 100 singles chart. Nothing could dampen our soaring spirits at the achievement of such a haunting and powerful song that we’ve been wanting to hear since the publication of Mockingjay in 2010. Then the message and satire of the novels and films was clearly beyond comprehension for some as a leaf was taken straight out of the Capitol sensitivity handbook and a remix was distributed to radio stations. A remix. A remix of the song, ‘The Hanging Tree.’ Oh brother! And our souls wept! Katniss Everdeen blazed a trail in her few years in the public eye and moved past iconic literary and cinematic symbolism and was now being used as political inspiration. Donald Sutherland would be proud. She was No.7 on Time’s list of the most influential ficitonal characters in 2014 and the girl from District 12 had her very own waxwork in Madame Tussauds. Not forgetting the woman who played her, Jennifer Lawrence was named the top grossing actor of 2014. Awards season was upon us again and Mockingjay Part 1 was nominated for a Golden Globe for Best Original Song, Motion Picture for Lorde’s ‘Yellow Flicker Beat.’ Fans rejoiced as release dates for Mockingjay Part 1 on BD/DVD would be as soon as February and the official twitter hinted at possible deleted scenes, with stills we weren’t sure we saw in the movie and with quotes which we knew definitely weren’t in. Jeffrey Wright released an impassioned and informative. video for the Ebola Survival Fund featuring himself, Jennifer, Josh, Liam, Julianne and Mahershala entitled #MisinformationHack. December ended as it began with box office reports that Mockingjay Part 1 had helped push Lionsgate earnings over $1 billion and that the movie had now made over $300 million domestically. Not even a year old and Jabberjays.net has managed to carve out a nice little community in a crowded market. None of which could ever be achieved without you, dear reader. Every news item, every video, every editorial, every piece of graphic art, every interview and every review is made for you. To give you the best possible home to discuss, argue, revel, geek-out and share everything to do with The Hunger Games. This website would have been extremely pointless with no one there to listen. So thank you for visiting. Thank you for staying. Thank you for commenting, downloading, tweeting and liking. And thank you for spreading the word faster than a jabberjay can. Sure, we have stage shows and exhibitions to look forward to. But 2015 will be the last dose of major fan excitement as we move closer to the final installment in the cinematic series. So do please hop on board with us here at Jabberjays.net as we attempt to make it a year to remember for you. Happy New Year and may the odds be ever in your favor.